This tutorial explains how to setup WordPress Comments Import & Export Plugin. Please refer to the product page to know more about the plugin features. WordPress Comment Import Export plugin facilitates online store Admin to export or import WordPress article comments and WooDiscuz Discussions about the products by using a CSV file. Admin can also customize WordPress article comments and WooDiscuz Discussions of the product according to the need. The plugin is mainly used by store owners/Admin to make the transaction of WordPress article comments and WooDiscuz Discussions from one store to another. You can import/export/merge (update existing WordPress article comments and WooDiscuz Discussions of the product ) hundreds, even thousands by using one file which saves your effort and time of manually adding WordPress article comments and WooDiscuz Discussions of the product. 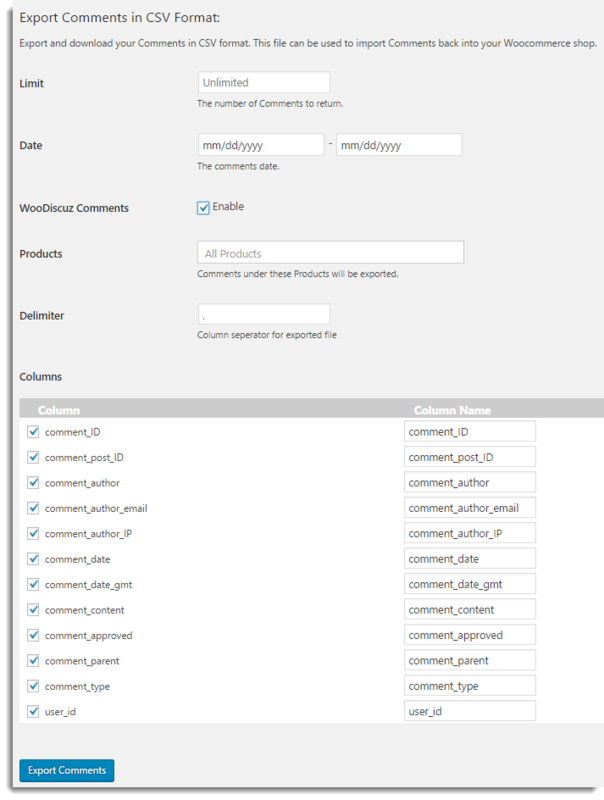 For importing WordPress article comments and WooDiscuz Discussions of the products to your online store, you must create a CSV(Comma-Separated Values) file which contains information about mapping fields in the tabular form. You can create CSV file by using a spreadsheet program, such as Excel, or Google Spreadsheets. Save this file with extension .CSV. After entering all details about WordPress article comments and WooDiscuz Discussions of the products in a spreadsheet, you can import to your online store. With this plugin, you can also export details of WordPress article comments or WooDiscuz Discussions of the product as a CSV file. While exporting, plugin facilitates you to apply filters by using the name of product, comment dates, and comment number limit. It is recommended to take the backup of the existing comments in the CSV file by exporting the comments first and then import the comments according to the requirement. The user has to install WooDiscuz plugin to import/export WooDiscuz discussions. After purchasing the plugin by Xadapter, plugin Zip file is available in MY ACCOUNT. 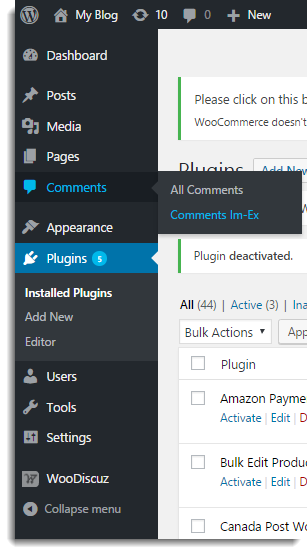 Plugins > WordPress Comments Import/Export > Import Export. The plugin takes CSV file as input. It maps each field of CSV file to the field of the WordPress comment or product discussion that otherwise Admin need to input manually. For example: Comments ID field gets mapped to the Comment ID of CSV file and the Comment Author Name field gets mapped to the comment_author of the comment. If you want the plugin to work correctly, you must map headers of all of the column correctly and you must ensure that all of the fields you enter must be in the correct format. To get started, you must have CSV file. You can create the one or you can export the WordPress comment or product discussions to get the format of CSV. 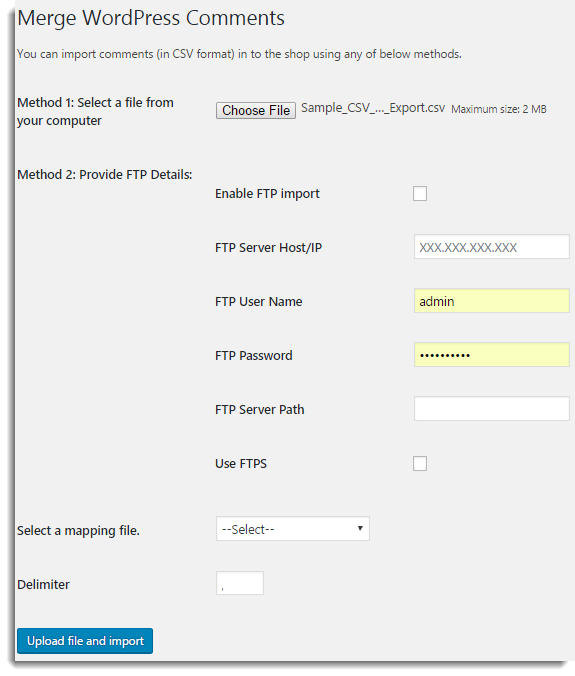 Or you can download Comment Import Export Sample CSV. You can import WordPress comments or WooDiscuz Discussions of the product from CSV file or merge it with already existing by importing updated CSV file. 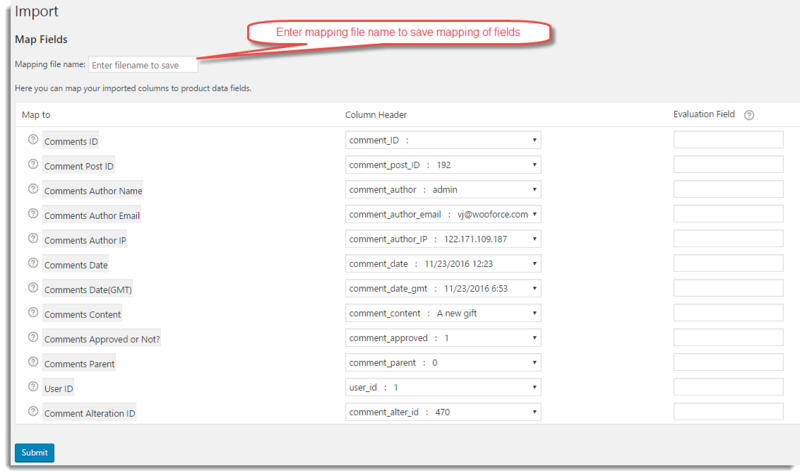 Note: While mapping fields, do not import Comments ID as it does not exist before importing comment. 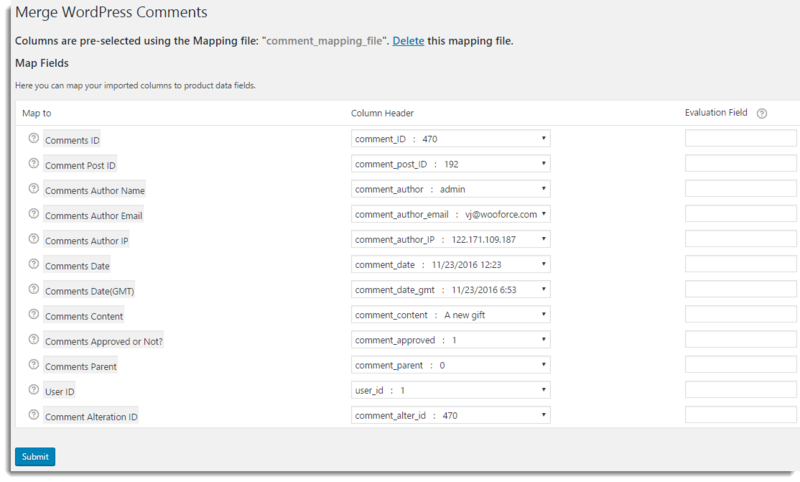 But for merging WordPress comments or product discussions , you need to map Comment ID to appropriate field. Select a required option from the drop-down list. Here, comment_post_ID is mapped to Comments Post ID. Note: Mapping is very helpful if you are importing CSV from some other e-Commerce like Magento. Assign any required constant value to field. For Example : Suppose, you want to assign 1 to comment_approved. Under Evaluation field, write =1 in Comments Approved or Not? row. Append any field by required value. For Example : Suppose, you want to append comment_author by By HikeForce. Under Evaluation field, write &By HikeForce in Comment Author Name row. Prepend any field by required value. For Example : Suppose, you want to prepend comment_content by Comment: . Under Evaluation field, write &Comment:[VAL] in Comment Content row. After mapping all the required field, you can save these mapping and evaluation fields in a file (user defined) by using Mapping file name field. Suppose your existing WordPress comment / WooDiscuz Discussion of the product got modified. To reflect that modified WordPress comment / WooDiscuz Discussion of the product into your online store, you can update the current it by importing modified CSV file. 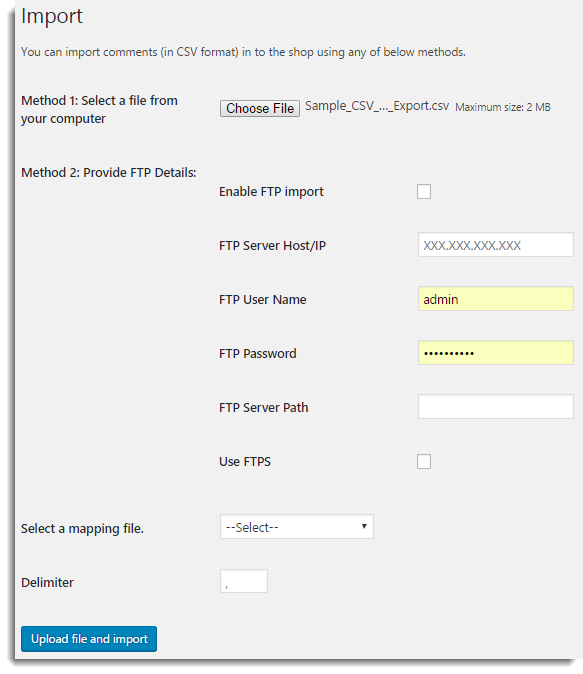 Browse the updated CSV file by clicking on Choose file or by FTP settings. 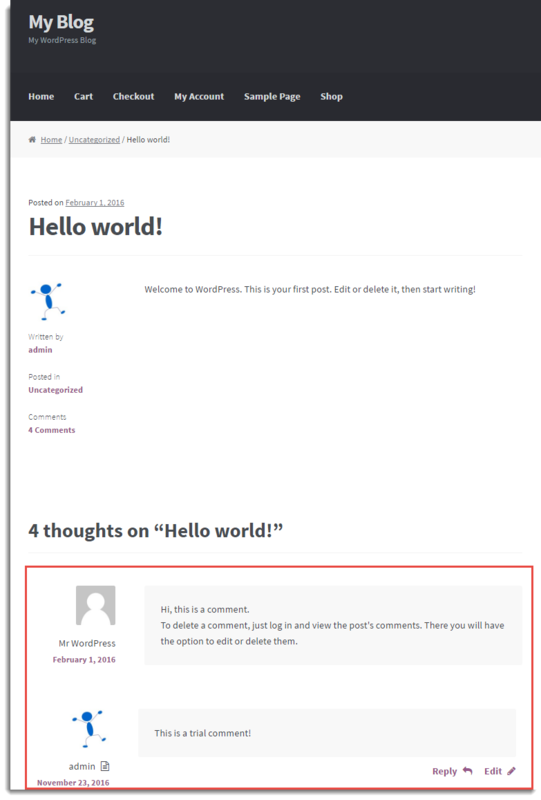 Note: If WordPress comments / WooDiscuz discussions do not exist, then the WordPress comment / WooDiscuz discussion is imported as new. If you export WordPress comments / WooDiscuz discussions using this plugin, you get the CSV file which contains the data about all the WordPress comments / WooDiscuz discussions of the WooCommerce online store. Limit: Enter the number of comments that you wish to export. From Date: Select the date from which you want to export the WordPress comments / WooDiscuz discussions by clicking in this box. 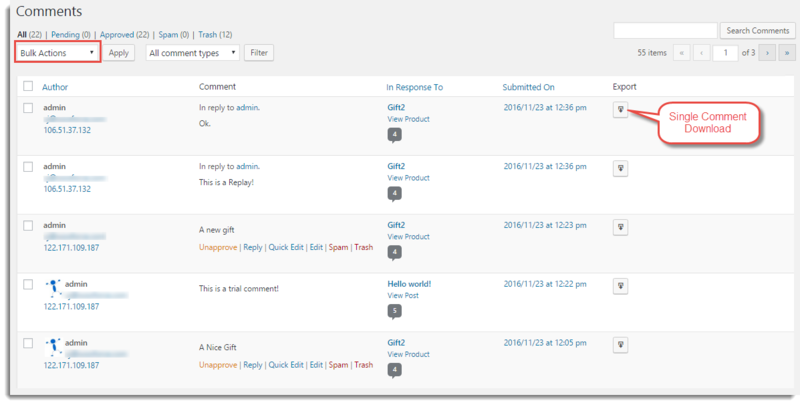 To Date: Select the date till which you want to export the WordPress comments / WooDiscuz discussions by clicking in this box. WooDiscuz Comments: Select the checkbox to enable the export of WooDiscuz Comments. Note: Once you select this checkbox, you can export only WooDiscuz Comments. To export WordPress comments, de-select the checkbox. Products: Select the required product(s) for which you want to export the WooDiscuz discussions. Note: You can download the Exported Sample CSV of WordPress Comments. Note: You can download the Exported Sample CSV of WooDiscuz Discussions. Click Download to CSV button to export single comment details to CSV file under Export Column. 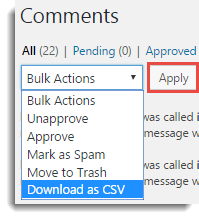 All the details about selected comments get auto-downloaded to CSV file. For automating Import and Export of comment, you can use the Cron job feature. 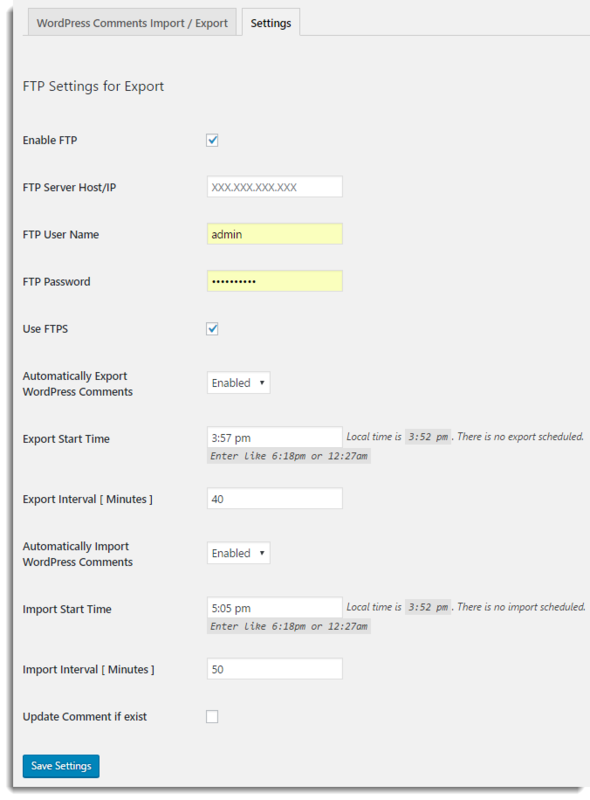 Choose the Enabled option to Automatically Export WordPress Comments to FTP Server Host/IP. Enter the required Start time for Exporting the comments. Enter the time Interval in minutes for exporting the comments. You can see the auto-exported CSV file of comments details on FTP server. Choose Enabled option to Automatically Import WordPress Comments from FTP Server Host/IP. Enter the required Start time for importing the comments. Enter the time Interval in minutes for importing the comments. Select Update Comment if exist checkbox to merge existing comments with the updated details. 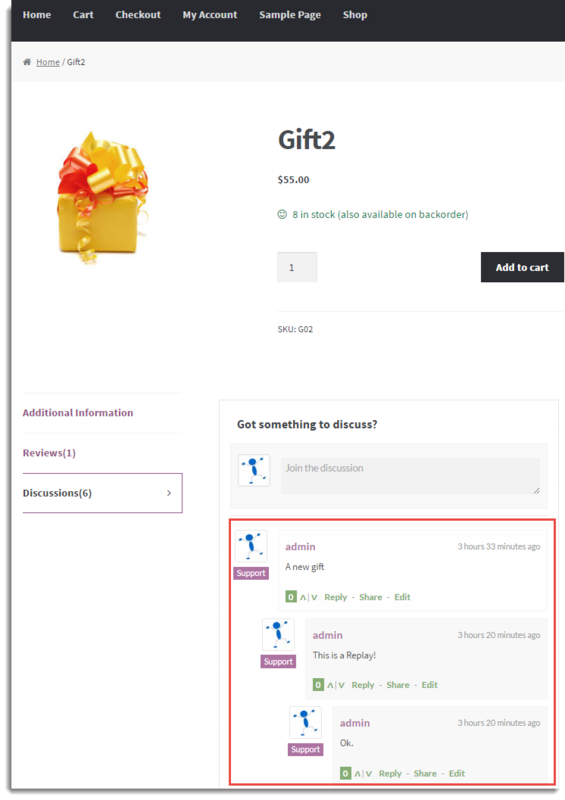 The Merging of the comment is possible only if the Comment ID already exists in your online store. Otherwise, the comment is imported as a new. Check out our WordPress Comments Import & Export Plugin. I’ve just import comments on my new website and the oldest one appears first. I’d like that the first comment that appears is the more recent… how can I change the order ? By default, the comments are imported based on the comment_date. The comment with the latest date will be displayed first. Please make sure that the date is provided in the format YYYY-MM-DD h:m:s. If the issue still persists please reach us via support. I just used your plugin for exporting comments from my old website, after that i created my new website, but during importing process it just fails. How can import them to the new site? Can you please explain it. Could you please mention what error you are receiving during import. Kindly make sure that the importing CSV is having default date format(YYYY-MM-DD). If you are having custom date format you may please specify it in the evaluation field of date while importing. Please reach us via support. Hi, how can I make it work on multisites? it seems that on my root domain ex. domain.com, the plugin is working but on other created sites ex. domain.com/site-one, it doesn’t export/download the csv, it just redirecting to site-one main dashboard.